Latest Natural Treatment & Medicine for Osteoporosis Symptoms. Osteoporosis symptoms often starts in midlife with age associated decrease in bone mass. However, women begin to lose bone with increasing rapidity in the years following menopause. This leads to significant risk of serious fractures. Osteoporosis is a condition that causes low bone mass and a decrease in bone tissue resulting in weaker bones. One of the most frequent osteoporosis symptoms is sudden fractures. Often referred to as the silent disease, osteoporosis symptoms are often unnoticeable until a fracture occurs. Following the first fracture, there is a high risk of suffering from additional breaks and these fractures can become debilitating over time. There is a strong relationship between the loss of estrogen following menopause and osteoporosis. This is largely due to the function of certain cells which are related to the amount of circulating hormones in the body. In particular, osteoclasts which are responsible for reabsorbing bone begin to overtake the functioning of osteoblasts which rebuild it. Estrogen also is crucial for calcium absorption. Hormone replacement therapy (HRT) has long been recommended for post-menopausal women who experience early menopause, have low bone density along with menopausal symptoms or who have risk factors of developing osteoporosis. While it is believed that HRT can slow the development of osteoporosis in post-menopausal women, there are numerous negative outcomes associated with it, many of which can be life threatening, especially in women with a hereditary predisposition to certain diseases. Due to these risks, medical experts have concluded that recommending HRT is premature at this time. Women are increasingly aware of the risks of developing osteoporosis especially after menopause. Yet they also know the risks associated with HRT. As such, they are looking for latest treatment for osteoporosis. Many herbs and supplements produce phytoestrogens to simulate hormones without the negative effects HRT. These can help slow osteoporosis development both through the effects of the simulated hormone as well as through directly effecting bone health. Calcium - strengthens bones, prevents decreased bone density and brittle bone syndrome. Magnesium - strengthens bones and increases calcium absorption. Made from a powerful blend of each of the listed supplements, Formula for Women is one of the best natural menopause supplements available. It helps decrease many symptoms of menopause. In addition to restoring hormonal health and alleviating many other menopause symptoms, Formula for Women promotes healthy bone growth and decreases the risks of osteoporosis. It is safe and effective, without the risks associated with HRT. Formulated with precision by a pharmacist in FDA registered facilities, Formula for Women is made with only pure ingredients and can be obtained without a prescription. Don't let osteoporosis discomforts your life. 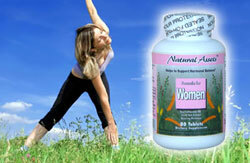 Try our top quality herbal complex Formula for Women. Not only will you feel better, you'll be able to stay active without worrying about bone fractures. Click here for more information.